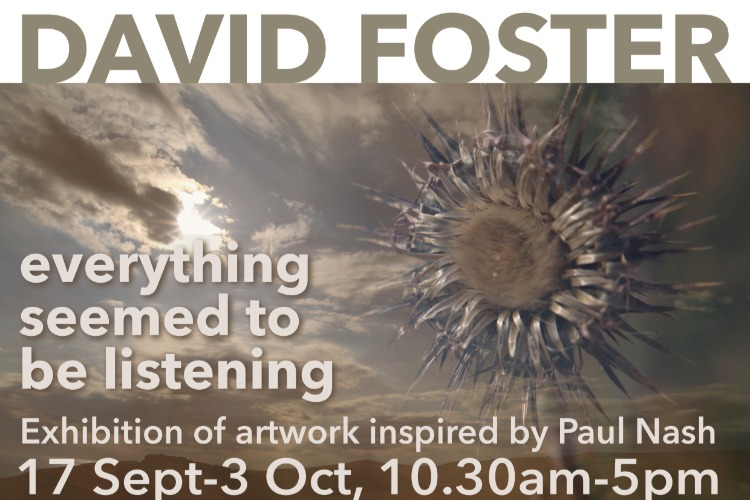 everything seemed to be listening is a project by the artist and academic David Foster, which uses photography, video and found objects to respond to the work of, and places associated with the work of, the artist Paul Nash (1889-1946). The project is generously supported by Arts Council England through their Grants for the Arts and National Lottery Project Grants schemes. 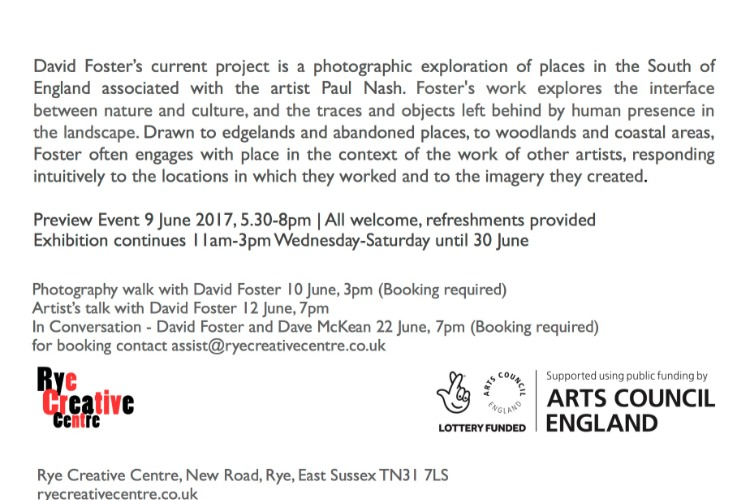 The first body of work from the project was shown at a three-week exhibition at Rye Creative Centre in June 2017. 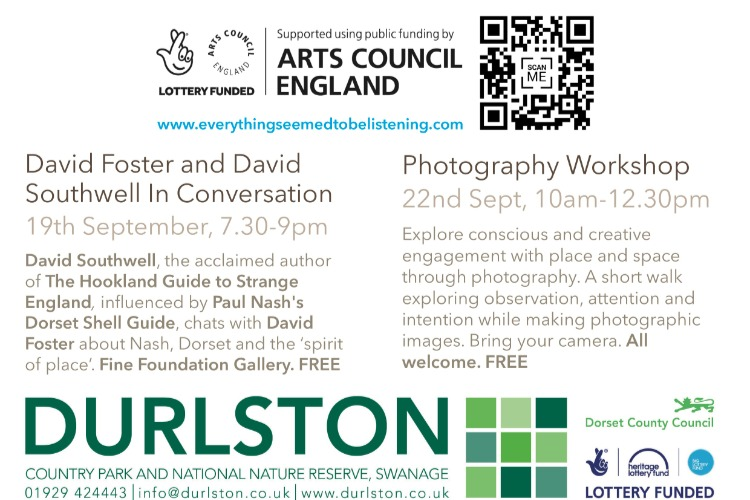 The second body of work from the project was shown at a 17-day exhibition at the Fine Foundation Gallery at Durlston Country Park in Swanage in September/October 2018. Some associated events - talks, walks and workshops - took place in conjunction with both exhibitions. Displayed on this website are around 100 images and 10 video pieces created for the project. The images and videos collected here are arranged by county. There are many more images (around 650 in total) on the project's Twitter feed and Facebook page. Also displayed here are some installation views from the two exhibitions, some images of the found objects that were included in the exhibitions, and some images of the photography walks and workshops that took place as part of the project. Since 2011 David Foster has used photography to explore the concept of place, often in the context of the work of other artists. This project continues to pursue these interests through an exploration of places in Southern England associated with the painter, photographer and writer Paul Nash. Foster’s artistic practice involves responding emotionally and intuitively to the places and spaces in which he works, the resulting images coming to document less the places themselves than the energies the artist finds there. The interface between nature and culture is a recurrent theme in Foster’s photography, and consequently he is often drawn to places such as edgelands, wastelands, and borderlands, and to ruined, derelict and abandoned places. His work often explores the transitory nature of human presence: the traces, both physical and intangible, of the departed, and the ways these human traces commingle with the more enduring presences of 'nature'. The images and videos created for this project constitute Foster’s response both to the places in which Nash lived and worked, and to the dynamics that Nash brought out of them in his own imagery. 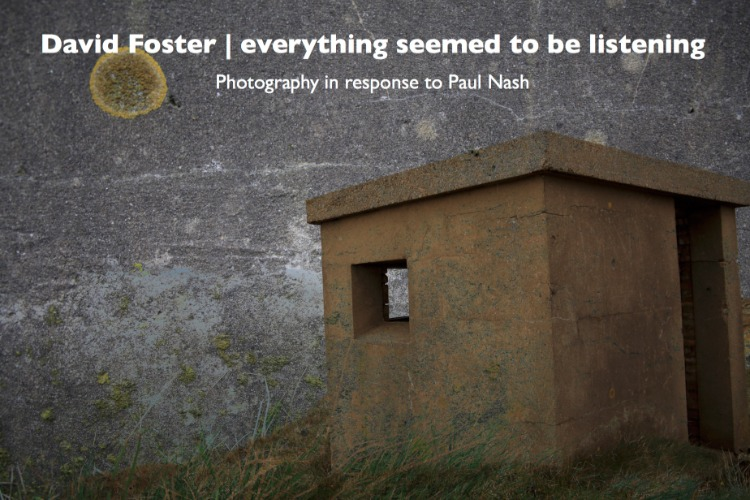 Having already made images in and around a number of places that feature prominently in Nash’s oeuvre, Foster conceived this project as a way to respond to Nash more directly and extensively. The areas and locations that played a significant role in Nash’s life and work include: Avebury, Romney Marsh, Iver Heath, the Chilterns, the Vale of Leadon, Wittenham Clumps, as well as Rye and Swanage: the locations of the two exhibitions. In all of his work informed by other artists, Foster enters into a dialogue with the places in which particular artists worked, and with the imagery they created there. The artist and their work become something of a guiding spirit to his own journeys in and around those places. Recent photography projects have taken him to the American South to make images in places associated with the late musician Mark Linkous, and to Ireland to respond to places associated with the painter and writer Jack B.Yeats. Other artists that his practice has engaged with over the years have included John Clare, Franz Kafka and Samuel Beckett. In the relatively early stages of this project, Foster began working extensively with double exposure photographs, finding this to be an effective means of engaging with what Nash referred to as ‘the life of the inanimate object’, and of uncovering, or forging, correspondences in nature. The resulting images often experiment with fractal, almost kaleidoscopic imagery, variously evoking both a mystical and a playful engagement with place, with objects, and with the natural world. As with all of Foster’s photographic work, the images and videos are titled with a grid reference (in this case the Ordnance Survey grid reference code) giving the location where the work was made. All of the images were made in camera and not subject to any digital manipulation. That is to say, the double exposures are created in the field using the camera itself, not in post-production. Found objects formed an increasingly important part of Nash’s practice as his career developed, and the project yielded a number of found objects that Foster brought back from his peregrinations around Nash country. David Foster was born in Aldershot in November 1979 and grew up in Northumberland. He studied at the Universities of Plymouth, Newcastle, and Reading, and completed a PhD at the latter in 2011, in the Department of Film, Theatre and Television, where he currently teaches. His writing on film and photography, amongst other subjects, has appeared in various books and academic journals, and online.